Press Release- The stage is set for Indian audiences to experience the spectacular Broadway-style musical, Disney’s Aladdin. 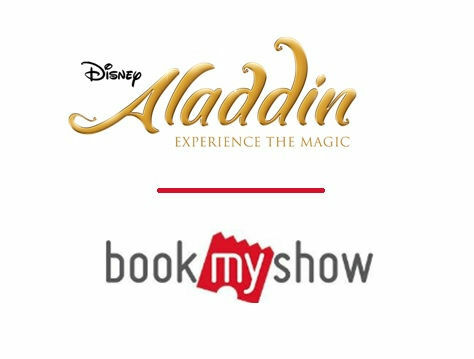 BookMyShow is the producer with exclusive rights for the Indian production of this Disney smash hit and will bring to life the magic of this fable for the first time on the Indian stage. The spectacular musical will premiere at Mumbai’s National Centre for the Performing Arts (NCPA) in April 2018. In 2015 & 2016, Indian audiences were mesmerized with India’s first-ever Broadway-style musical, Disney’s Beauty and the Beast. With astounding local talent, stunning sets and breathtaking performances, the musical had registered sold out shows in both its seasons. Disney’s Aladdin, the classic fantasy production, has already enchanted audiences in the United States, United Kingdom, Australia and Japan. And now, the incredible spectacle will be reimagined and developed by the best of Indian talent to make it locally relevant, without losing the original essence of the Broadway show. This time, India will locally produce a completely original, non-replica version of Aladdin The musical which promises to set new standards for live entertainment in our country! The show, sponsored by PayPal, will also travel to Delhi and Hyderabad. PayPal will be the preferred payments partner for the musical, allowing people to buy tickets through it’s seamless and secure payments system. 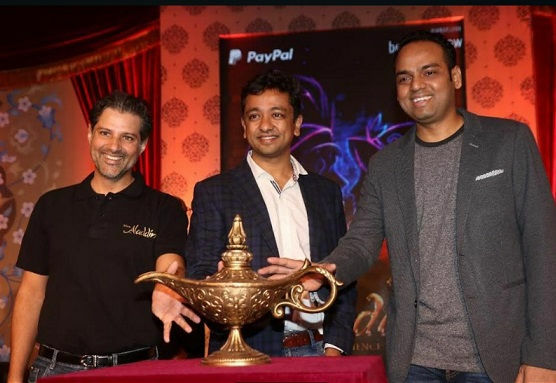 Given the high anticipation among audiences for Disney’s Aladdin, Ashish Hemrajani from BookMyShow, Abhishek Maheshwari & Vikrant Pawar from Disney India unveiled the first look of the musical today. “The live entertainment standards in India are rapidly catching up with the rest of the world and BookMyShow is proud to have been continuously playing its part in this transformative journey. We are absolutely excited to produce the Indian stage version of Disney’s Aladdin which will open its doors to the audiences in just a few months from now. It promises to be an extravagant visual feast, filled with music, joy, and loads of theatrical magic,” said Ashish Hemrajani, CEO and Founder, BookMyShow. “Disney stories are timeless and have a special meaning for everyone in the family. Stories like Aladdin and Beauty and the Beast are universal and can engage fans everywhere. In India, we are committed to developing world-class entertainment that families can relate to and become a part of their everyday lives. We partnered with BookMyShow, given their deep understanding of the local audience and their quality of consumer engagement,” said Abhishek Maheshwari, Country Head – Disney India. The Indian production boasts of extravagant sets, lavish costumes, beautifully choreographed sequences, mesmerizing special effects and the flying magic carpet, which will instantly transport the audiences into the magical world of Agrabah. Over 50 performers will weave the enchanting story on stage, taking the viewers on the fun-filled adventures of Aladdin and making this musical a unique experience. “Disney’s Aladdin will be reimagined locally with an all Indian cast and creative talent. The story of Aladdin has universal appeal and is highly popular with the Indian audiences. The musical is an entertaining celebration of Aladdin’s love for Jasmine and his friendship with Genie. This thrilling new production filled with magic, humour and breathtaking spectacle will transport fans to a whole new world,” said Vikranth Pawar, Head – Live Entertainment & Local Content Studio, Disney India. Originally produced by Disney Theatrical Productions, the show features music by Tony Award and eight-time Oscar® winner Alan Menken (Beauty and the Beast, Newsies, Sister Act, Little Shop of Horrors), lyrics by two-time Oscar winner Howard Ashman (Beauty and the Beast, The Little Mermaid) and three-time Tony Award and three-time Oscar winner Tim Rice (Evita, Aida). The talented actors who will bring to life this iconic tale on stage include Siddharth Menon (Aladdin), Taaruk Raina (Aladdin), Kira Narayanan (Jasmine), Mantra (Genie), Roshan Abbas (Jafar) and Vikrant Chaturvedi (Jafar). The registrations for the Disney’s Aladdin musical will go live on BookMyShow tomorrow, February 28, 2018. The registered users will be able to buy their tickets during an exclusive pre-sale window through PayPal.